Of all the new titles, Batman Beyond is one of the most exciting, but it’s also one of the most mysterious. What can you tell us about it? Dan: With Futures End, we began to integrate Batman Beyond into the DC Universe, but the context we saw him in was more present day DC Universe, or more accurately the DC Universe five years from now. What this is going to do is start to integrate Batman Beyond into the DCU by way of his own future. Futures End is going to come to end, Batman Beyond will return to the future and we pick up on his world there. We start to explore how that world thirty-five years from now is different, how the DC Universe gets there, what the differences are and what we can play with to make it really fun and adventurous for readers. Bernard: The animated version, their futuristic sensibility is sometimes, I think, a little too far out. Dan has been throwing a lot of stuff at me—hopefully I’m retaining all of it—but some of it was, Syd Mead and Ralph McQuarrie with a splash of Blade Runner. There are a lot of things that will be recognizable and relatable to today—it’s not cities floating in a cloud—but there will be a futuristic element. Bernard, in addition to Syd Mead and Ralph McQuarrie, were there other influences that you looked at to bring the futuristic world of Gotham to life? Bernard: Part of it was picking Dan’s brain. Translation is a lot of the process—translating what’s in his head into what’s in my head, down into the final book. Dan: What I told Bernard is, if you look at [Mead and McQuarrie] as designers, their stuff would always have that futuristic look to it, but it’s usually a further off future. We needed to be a little more tangible about that. That’s where I referenced Blade Runner. You could tell we had jumped into the future—that old building is still there, but now it has a better neon sign on it. We want to have a future that is more tangible than what we saw in the animated show. Bernard: I have a degree in architecture, and a lot of that is form follows function. You want to be able to have buildings and structures that make sense today, but also with a slight twist or addition to it. What tone are you guys aiming for with this comic? The animated series really was all-ages. Are you going for the same thing with this? Dan: In a way, yes. I refer to it as “exotic adventure.”It’s exotic because we’re talking about the world as it is then in the future, which is certainly going to be different than what we see in the DC Universe right now. And it’s an adventure because we can tell just about any story we want to—no one can tell us that we can’t blow up Metropolis. Everything is really opened up to us in that way. I think we have a lot of opportunity to kind of blow the lid off of this thing. Bernard: There is going to be a slight grittiness to it. It’s not as futuristic and clean as the animated series. 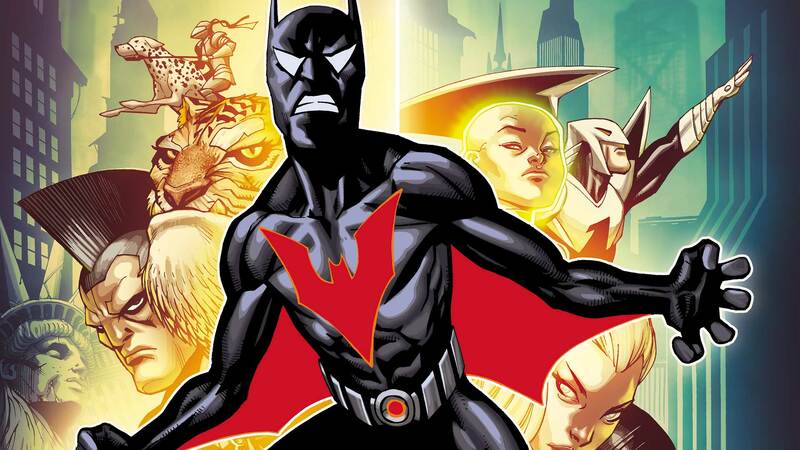 With this new series, how dramatically different will the character of Batman Beyond be? Will he be more or less what we’re familiar with? Will he have the same powers and abilities? Dan: The powers of the suit are going to pretty much be the same. Even in a world thirty-five years from now, it has got to be stuff that is theoretically possible. It’s the world around him that changes. We’ll see some of the characters that we know from the animated series, one of which will be showing up in the first story. We’ll also be seeing other characters from the DC Universe as we know it that weren’t in the animated series. I was wondering about that – do you have plans to use some of the villains from the animated series? Dan: I think so, because there were some really cool concepts that were introduced there, but we aren’t going to start off with that. If we go too far into the animated series right away, with the villains, the supporting cast and everything else, people will start to say that it’s Batman: The Animated Series. Of course, if we ignored it entirely, people wouldn’t see it as Batman Beyond. I think there’s a balance there that I want to strike right away and let people know that yes, it is in the Batman Beyond universe, but we are little different. This is DCU stuff now. Batman Beyond’s relationship with Bruce – is that still going to be maintained in this version of the future? Is Bruce still there? Dan: There is a Bruce there, yes. It’s hard to know what to ask here because I don’t know exactly where you’re going with this one! Bernard: That’s the fun of it. That is really one of the greatest appeals of this book. There are so many possibilities, so much stuff that people already know, yet they don’t really because it’s an open playground, it’s an open field. This book is a part of such a diverse slate. Which of those books are you excited to check out personally? Dan: It’s funny because, we both identified Bizarro. Bernard: Hopefully Bizarro will appear in Batman Beyond! Dan: Also, the minute I saw Black Canary, I thought that looked really interesting. She has the ripped fishnet stockings which is like, well of course that would happen! As a whole entire effort, there’s a lot of tremendously different and interesting stuff there. Bernard: The infusion of all the people involved with these books—gender, social, cultural backgrounds—the voices that are going to be speaking in this June launch, it’s tremendous and reflects how far we’ve come. It’s really, really empowering, motivating and enlightening to see all of these different kinds of people coming together to create stories. It’s exciting just being here and seeing all of these different artists and writers that even a few years ago had not done a mainstream monthly book before. BATMAN BEYOND #1 by Dan Jurgens and Bernard Chang is now available in print and as a digital download.